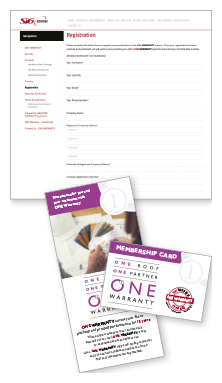 Visit the Contractor Registration page and complete the simple form to become a registered ONE WARRANTY contractor. We will send you a welcome pack which will include your ONE WARRANTY Membership Card, FAQ’s, Sample Certificate (including T&Cs) and marketing material for you to give to your customers. You’ll also receive your membership number which will be written on you ONE WARRANTY membership card. If at any time your free supply of Property Owner leaflets runs out you can order some more by simply calling the ONE WARRANTY hotline on 01480 466777. Through your local SIG Roofing branch, purchase the relevant materials required for the job, making sure you select qualifying products and complete the project. Once you’ve finalised and are happy with the project, access the Warranty Application page to apply for the warranty. SIG Roofing will then verify your purchases and process your application. 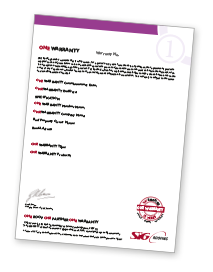 Once the application has been processed, we will send you the ONE WARRANTY certificate. Your customer will also receive this for their records. When you come to select a contractor, check that they are registered with ONE WARRANTY – so that you can take advantage of the 15 year warranty on all the key elements of your roof. Once you’ve been quoted for the job, ensure all the products the contractor is using qualify for ONE WARRANTY . Full details of the qualifying products can be found here. Once the job is complete and everyone is happy, the contractor will apply for ONE WARRANTY online on your behalf. Once and the application is verified, SIG Roofing will send a copy of the ONE WARRANTY certificate to the property owner and the contractor. In the unexpected event of a potential claim you’ll need the certificate – so be sure to keep it in a safe place. Just call your contractor and they will take it from there for you. ONE WARRANTY allows you to have confidence that your investment is protected with a warranty that is easy to understand and even easier to use.